In Spring 2010, students in my Women and Public Policy seminar conducted research and drafted policy recommendations on how Congress might update and improve the Violence Against Women Act. 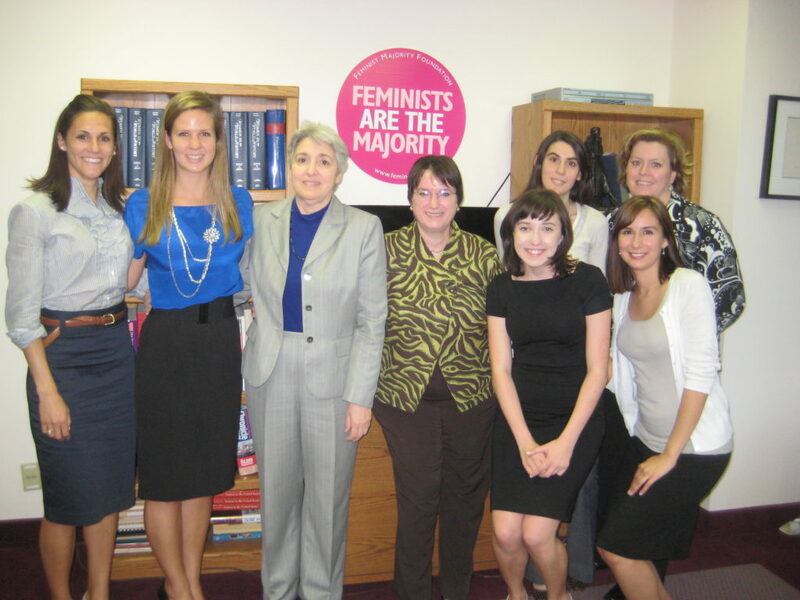 The teams went to Washington to present their findings to Vice President Biden’s senior aide for women’s issues and to the Feminist Majority Foundation leadership, including Eleanor Smeal and Kim Gandy (pictured here). Philanthropy: The Theory of Practice and the Practice of Theory (PUBPOL 560S). We hear a lot about the “top 1%” and their role in elections, but America’s wealthy have an arguably larger influence on society and public policy through their philanthropic giving and civic leadership. Through discussion and case studies, we explore the history of American philanthropy; study successful and failed strategies for giving away large sums of money; and debate the obligations and opportunities of wealth amid rising income inequality and declining faith in government. Working in teams, students also research, write, and present a philanthropic strategy for a “real world” donor. Here’s an article about a past project (see p. 10). The Fall 2016 syllabus will be accessible here in late August. If you’re in this class, the required books are Joel L. Fleishman, The Foundation; Dale Russakoff, The Prize, and Peter Frumkin, The Essence of Strategic Giving. Political Analysis for Public Policy (PUBPOL 301 / POLSCI 310). This is the core politics course for Duke public policy majors. The emphasis is on applying theory to contemporary policy cases and on learning to write for policy audiences. Students may also choose to supplement the course with a research & service project for a Durham nonprofit. Students have worked with groups focusing on refugee resettlement, public education, low-income housing, substance abuse recovery, animal welfare, adult literacy, and free-market policy advocacy. Whose Democracy? Participation and Public Policy in America (PUBPOL 266S). This seminar provides an overview of theories of political participation, with case studies illustrating how they reflect and often perpetuate various dimensions of inequality. We also examine emerging modes of participation, such as social media, to assess whether they are leveling the playing field. And we discuss normative questions: What, if anything, should we do to enhance participatory democracy. Students in this course typically work with a community-based partner to produce a research project, video, or other “deliverable” that will help the organization better engage its constituencies. I teach a version of this course each Spring in the Duke in DC program (PUBPOL 261SA). Women and Public Policy (formerly PUBPOL 264S). This seminar considers the role of women have changed society and public policy in their capacities as voters, voluntary association activists, social-movement participants, and elected officials. We also examine how public policies here and abroad facilitate both the oppression and emancipation of women. Students complete a major research project, with policy recommendations, for a women’s organization. In 2010, students went to Washington to present their research on the Violence Against Women Act reauthorization to the Office of Vice President Biden.